Roman "Romeopro33" Romanovskyi Wins The High Roller For $107,500! After more than eleven hours of play, Event #36 - $2,100 XL Eclipse High Roller finally crowned a winnerRoman "Romeopro33" Romanovskyi from Ukraine claimed the victory and the first prize of after beating "lacibaby64" in the deciding heads-up. This event, with a buy-in of $2,100, saw 171 players register and those players made 72 rebuys to get a total amount of 243 players. 888poker guaranteed at least $500,000 so there was a bit overlay. The prize pool was $500,000 with 27 places paid. Familiar faces like Anton "anteen" Bertilsson, Mike "SirWatts" Watson, Chris "888Moorman" Moorman, Scott "AggroSantos" Margereson and Fabricio "DrMiKee" Gonzalez missed out on making the money. The bubble didn't take that long, after "OMGsete" losing with pocket sevens against the pocket eights of "AlexMax15". After the players reached the money, it went pretty quickly to a final table. On the bubble of the final table, Canadian "SleepinAwake" was the shortest stack with ten left and he went all in with ace-nine. Big stack "Romeopro33" found ace-queen and saw his hand held. "SleepinAwake" finished in tenth place for $8,750 while the remaining nine players were moved to the official final table. On the final table, "AriGold17" exited in ninth place for $10,000 after losing with ace-jack against king-queen. "AlexMax15" (eight, $15,000) followed him to the rail, he busted with king-ten against ace-eight. The remaining seven players played for a while before "2pacnrw16" (seventh, $20,000) and Nicholas "PKaiser" Fierro busted in quick succession. Dutchman "Poker86ss" busted in fifth place after losing with two pair against the straight of "allesrigged". The final four players played together for a while before "allesrigged" lost his chips with ace-queen against the five-three of Simon "Isildur1337x" Matsson. He had to settle for fourth place and he received a prize of $43,750. With three players left, once again it took a while before someone busted. Then, from the small blind, Roman "Romeopro33" Romanovskyi put all the pressure on Matsson in the big blind. Matsson called with ace-eight and was in front against the ten-four of his opponent. Ukraine's Romanovskyi flopped a ten, turned a four and won the hand to bust Matsson in third place for $48,750. Roman "Romeopro33" Romanovskyi started the heads-up with even stacks, but in just a few minutes he took full control. 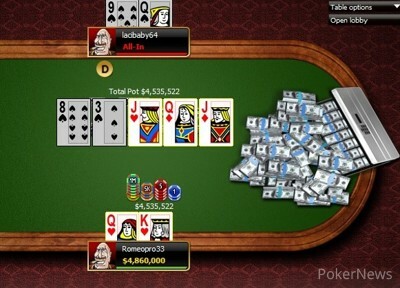 In one of the first big hands, he secured himself of this victory and the first prize of $107,500. In the last hand, he won with king-queen against queen-nine on a queen high board. From the small blind, Roman "Romeopro33" Romanovskyi put all the pressure on Matsson in the big blind. Matsson called with ace-eight and was in front against the ten-four of his opponent. Ukraine's Romanovskyi flopped a ten, turned a four and won the hand to bust Matsson in third place for $48,750. Five-minute break for the players. Simon "Isildur1337x" Matsson pushed all in from the button with and short stack "allesrigged" made the call with ace-queen. The Swede made two pair and busted "allesrigged" in fourth place for $43,750. He is down to just five big blinds and in need for a double.